As it pertains to fitness, I've always found action and superhero movies to be very inspiring. The transformations that these actors go through to successfully play their roles is absolutely amazing. 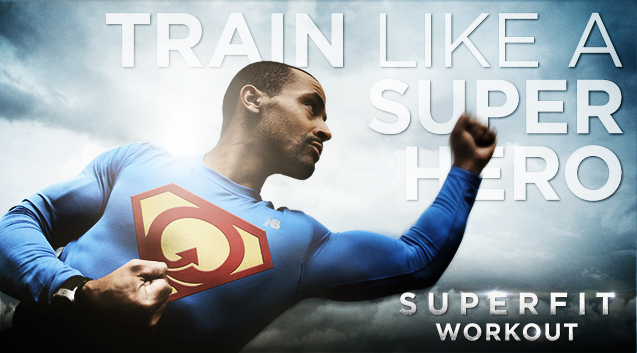 There is nothing more inspiring than the super-human abilities of our favourite superheroes. Each of us has a trigger within us that, when unleashed, can have a powerful impact on our lives. Sometimes all it takes is an inspiring thought that acts as the crucial element to get us out of a rut and propel us forward. Why is it that we can begin a workout routine with the motivation to get fit and accomplish our goals, but that initial momentum always seems to slow down? For some of us, momentum becomes so slow that we lose interest, drop our initial exercise plan and succumb to self-defeat. So, how is it that some people can break beyond this consistently? The real answer to this is two-fold --; a natural drive to abandon mediocrity and a consistent search for inspiration. It is human nature to stay where we are comfortable. Modern society also promotes this. We often operate on an existence of convenience and unfortunately a position of mediocrity. Media... Mediocrity... coincidence? I think not. In this age of media-driven existence, mediocrity often spells disaster in many people's lives. With companies telling us how to dress, what to eat, what cars to drive and even where to live, we are surrounded by a suffocating blanket of mediocrity that leaves us unwilling to think for ourselves and be productive, assertive ￼citizens. Top this off with the demands of work and responsibilities of family and relationships, and its no wonder why people can lose the energy and motivation to exercise. Exercise motivation is a topic I'm passionate about and find I'm always discussing with my clients and colleagues. Motivation itself doesn't just arise from nowhere. That ability and desire to continue to take action on something or work towards a specific goal is what most of us look to acquire. Just like anything in life, exercise success comes from being inspired. From that initial inspiration comes the motivation to follow through on something actionable. We've all had that moment where something moves us internally to start exercising. Maybe its buying a brand new pair of runners, the change of seasons or hearing an inspiring talk. This trigger or point of inspiration is different for everyone. When you feel it, you know it; it's like a spark has been lit within you and you acquire an immediate drive to take action. This is often when people come up with their most creative ideas, exhibit their best performance or inspire others. From these inspiring moments comes the motivation to continue the momentum. The only problem is that these moments are short-lived, so often we see a down turn in momentum and therefore motivation as time progresses. Ultimately, you can't maintain motivation without being inspired. Realizing this lead me to further research and practice the act of inspiration searching. Yes, actually searching for sources of inspiration in a systematic way with the goal of staying motivated no matter what area of life. You'd be surprised at just how effective this practice can be if you are consistent and purposeful in your approach. Knowing how much of an influence the media has on how we think and live, I've always seen its great potential to positively influence the public. In the realm of health and fitness, the information can be overwhelming and confusing; however, through sticking to trusted sources and using it in a positive way, media can be quite useful when it comes to motivation. One thing we all have in common is the appreciation for entertainment. Aside from being active, watching movies is a pastime of mine. There is nothing better than escaping reality for a couple of hours and experiencing a new world through the characters in a movie. Who wouldn't want to the ability to fly, scale a skyscraper or save a child from 50-foot fall? Action films like superhero movies can provide an amazing impetus to ramp up your fitness and generate that much-needed motivation. With such an interest in movies and fitness, I found myself over the years creating Hollywood blockbuster-themed workouts inspired by movies such as The Hunger Games, 007, Superman, Wolverine and Southpaw. I've used these movies as inspiration for my own workouts and as a tool to inspire others to get active. So, how do you maintain motivation to achieve your very best when it comes to health and fitness? Watching inspiring movies is just one way to trigger that initial inspiration. The real formula to success involves taking an interest-driven approach to your fitness with a strategy that involves regular and purposeful change by discovering new ways to become inspired. It must be personal to you but keep these points in mind throughout your journey. After revisiting and becoming very clear on your personal fitness goals take 10 to 15 minutes and write down anything that inspires you to get active. Include activities from the past that you would love to do again as well as activities that you've always wanted to try out. Make a point of trying one new workout routine per month. This could be in the form of a new class, taking your training outdoors or even a workout routine from a magazine or YouTube video. Once per quarter complete a fitness evaluation to set a new benchmark on your fitness and compare your results with your previous evaluation. This will do wonders for your sense of accomplishment and continued goal setting. Once per quarter spend 10 to 15 minutes writing down activities or events that you're inspired by and choose another one to try working towards immediately. Enlist in a partner to add more variety and accompany you on part of your journey.